The Geography Belt Loop is a good one to use with this theme, since railroads criss-cross the entire country. Ach. #1G – go and see a railroad museum or station. Ach. 14f,g – if you ride along a railroad bike path – notice and obey the safety signals and warnings! Ach. #23e – make a map showing a place you can visit by rail. Citizen and Communicator are assigned for this month. Go on a train ride – either regular, light rail, scenic, tourist. Many light rail (commuter) line run weekend specials when traffic is light. Ride an Amtrak train a short distance and return. There are historic steam train rides in many areas, perhaps you can get a group discount. The Wilmington and Western in Delaware runs out to a picnic grove. You can get off and have a picnic and return later. Visit a model railroad display or club for an exhibition. Visit a local train station. Many train stations have been restored and are used to attract visitors and tell the story of railroading. The Amtrak Station in Wilmington, Delaware has an historical designation. I am sure touring Grand Central or Penn Station in NYC would be a real eye opener. Watch Fess Parker in “The Great Locomotive Chase.” Maybe not, but I would really enjoy it. My wife knows she will lose me for a weekend if Disney ever does a Fess Parker Marathon (Davy Crockett, Light in the Forest, Old Yeller, …) CD J J But in a serious note there are many train movies – some regular commercial films, some videos of the dramatic scenery along the rails, some histories of steam. ü Visit a local railroad station. Call ahead and ask if you can have a tour – many of the old stations are wonderful, huge and with beautiful murals – even those that are no longer used as stations are sometimes open as historical structures and used for public events. Check the website listings or ask your local Chamber of Commerce or reference librarian. ü Take a short trip on a real train - ask about excursion or group rates. Ask about docents or tour guides, and see if brochures, paper engineer hats, paper train models are available. ü Have a Den put on a skit about the Driving of the Golden Spike – for an authentic account with a script adapted for 4th-6th grade students, Either get he skit from the Skit section of Baloo or go to http://www.nps.gov/gosp/research/script4_6.html.htm You can use the script as is or study the story with the boys and let them make up their own skit. The funny incidents in the script really happened! ü Visit a local model railroad exhibit as a den or pack.- check website for nearby exhibits. ü Visit a local railroad museum – check the website for locations. ü Invite a local model train collector to come and show some of his collection and talk about railroads.- check the website for a list of clubs and collectors in your area. ü Contact a railway that does business in your area – ask a representative to come and talk about safety around and on trains, what kinds of products trains carry in your area, how trains help supply stores and manufacturers, automobile dealers, etc. in your area. ü Help the Webelos Dens sponsor a RR Safety meeting at a local school, chartered organization or community center. Check under Webelos Citizen for ideas. Hold a clean up day at sponsoring organization. Rake leaves for an elderly citizen. Safety Hike: Hike around the school or park identifying safety areas for the children. Season Hike: While hiking identify what is changing to fall in the outdoors. While you absolutely CANNOT (No Ifs, Ands, or Buts) hike along active (still in use) railroad tracks the Rails to Trails Conservancy has established hiking and biking trails along abandoned railroad right of ways. And find trails in your area. They have a directory set up by state and most states have several subsections to help narrow your search. Also, learn about the great work they are doing in creating these recreational areas. The list tells you what is allowed on the trail – hiking, biking, skating (in-line and roller), skateboarding, Horseback Riding, Wheelchair Accessible,… An approved rail trail is easy to identify – there are NO TRACKS in the right of way. If you are hiking near tracks – you are being unsafe – leave that area!!! Materials – Large Cardboard boxes, paint, string, glue, wide ribbon (or rope), box cutters, paper plates, markers, construction paper, buttons and any other decorations. ü Use one large cardboard box per child. ü Cut top and bottom off. ü Make shoulder straps from heavy ribbon or string. ü Have each Cub paint or decorate his own train car. ü Use small painted paper plates for the wheels. ü Give each family about 20 minutes to decorate their boxes (this can be done at a den meeting) and then bring them to the Pack Meeting. ü At the Pack Meeting, the Den Leader becomes the “conductor” for his or her den. ü Each den then “hooks” up and then proceeds to parade around the track singing “I’ve been working on the Railroad” several times. ü The “judge” then gives out awards for the best looking, best decorated, best design, etc. and certificates to the dens. Let everyone make a conductor’s hat or engineer’s hat as they come in. Painter’s caps are usually available for free from paint stores or home improvement stores – just add stripes for an engineer’s cap. To make a conductor’s cap, take a piece of dark blue or black poster board and cut a strip about 4” wide and long enough to overlap when placed on the head. Staple the hat where it overlaps. Now make a flat brim shape with a rounded edge and a straight edge about 4-6 inches wide (wide enough to go start at one edge of the face and go to the other edge – You can use either poster board or construction paper. On the straight edge of the brim, leave an extra inch – this can be cut about every ½” so that you can fold it up and either glue or staple to the inside front of the conductor’s cap. Add Gold or silver logos and number – check out the ribbonrail historical website ( www.rrhistorical.com ) for actual photos of insignia – you could even download one and glue it to the front of the cap. You will need one skein of yarn for each family. This will take some time to set up, so plan to be at the pack meeting site early. Start with one end of each skein taped to a stationary object near where the cubs and their families will enter. Take each skein of yarn individually and string it around the room or outdoor location, ending at a picture or word strip with the name of a place you could travel to on a train. Start with another family’s skein of yarn, winding yarn over, under and around objects and other yarn skeins – you will end up with a maze. Make sure you have a different destination for each skein of yarn. Have a list of the destinations posted at the entry area. Before beginning, each family signs in and guesses which will be their destination. To play the game, each family starts with the end of their skein of yarn, winding it up in a ball as they go through the maze. Families who guess the correct destination win a package of string licorice. 2. Paint larger dowel black and smaller one silver. 4. Glue small dowel to the center of the larger dowel. 5. Glue clear bead to the center of the small dowel (headlight on front of the engine). 6. Glue black bead to top of slide. 7. Glue a section of PVC pipe to the back of the slide. 1. Trace the lid on yellow paper. Cut out the circle. Glue the circle on the lid. Optionally, if you have paint that sticks to metal, paint the lid yellow. 2. Cut two strips of black paper. 3. Glue on the yellow circle. 4. Write ‘R’s as shown. 5. Glue a section of PVC pipe on the back. 1. Cut the craft sticks to about 3” long. 2. Glue them like an X. 3. Paint the X white. 5. 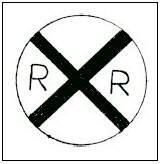 With the permanent marker, write “RAILROAD” and “CROSSING” as shown. 6. Attach a section of PVC pipe on the back. ü Use rectangle piece of wood to make a 1” x 3” floor of engine. ü Glue on a 1” square block for cabin. ü Glue 2” long dowel for front of engine. ü Screw in small wood screw with large head for smoke stack. ü Glue two wheels to front side of slide. ü Make larger wheel on the back. These can be caps from medicine bottles, buttons or cut from milk carton. ü Glue a piece of PVC pipe to back. ü Paint entire engine black. Assemble some scraps of wood and a broomstick section (or some spools) to make a toy train. Use a long board for the base of each car. ü For the engine, shape the base board to a point. Use sections of a broomstick and a block. ü Tank cars may be fashioned from sections of a broomstick and various size dowels. ü Use blocks of wood for the refrigerator car, caboose, etc. ü You can make movable wheels from small sections of a broomstick, 1/4” dowel axles and screw eyes. Drill a 1/4” hole in the middle of each wheel. Glue a dowel piece into one wheel. 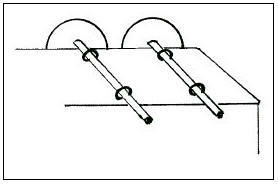 Place the dowel through two screw eyes attached on the bottom of the train (see illustration). Glue the other wheel onto the axle. ü If you are making a train for a decoration, simply fasten the wheels to the base with nails. ü It’s easier if you paint parts before attaching the wheels. ü To link the cars together, add couplings made from paper clips or cup hooks. Enlarge pattern to desired size. Cut out the pieces. This step may require adult assistance and can be done prior to craft time (if you’re coloring the cut out pieces, put a roll of masking tape on the back and tape lightly to newspaper or scrap paper). Glue the pieces together. It’s a good idea to pre-do one for a sample before doing these crafts with a bunch of young kids, so they can see what it looks like finished. Save your strawberry baskets to make a fun train. Simply connect the baskets (open sides up) with twisty ties. Use construction paper to make wheels, a locomotive cab, decorations for the cars, etc. and glue onto the basket. Tie a string to the front of the train to pull it around. Fill your cars with treats, Scout stuff, etc. ü Keep all candies in wrappers. ü Use a drop of tacky glue or low temp hot glue to attach each piece as shown. ü Glue the Lifesavers roll to the gum package, letting the Lifesaver roll hang over at both ends. ü Fold the extra cellophane around to the back of the round-wrapped candies and glue it down. ü Then glue the round- wrapped candies to the lower sides for wheels. ü Push the rectangular candy onto the Lifesaver body to make the cab of the engine. Glue on. ü Cut the paper off the top of the Hershey’s Kiss and flatten the point a bit by pushing it against the table. ü Put a good-sized glob of hot glue on the tip, and then glue it to the top of the Lifesaver roll. ü Glue the mini chocolate bar on top of the cab for the roof. You can substitute a rectangular candy package (such as Jolly Rancher) for the Lifesavers. Or, you can glue a set of Starburst candies together. 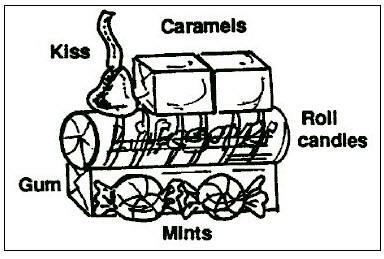 Instead of the Hershey Kiss smokestack, try one or two wrapped Rollo candies. Glue the top (smaller side) to the roll of Lifesavers. Glue another Rollo (larger side) on top of that if desired. Go to your local store and look for rectangles, circles, shiny wrappings, etc. in the candy department. These instructions are just to get you started. If you want to make cars for the train, simply use rectangular candies in various combinations with four round candy wheels. You could even put some Gummy bear passengers in some of your cars. Use this theme to teach the boys a little about topographic maps. If you don’t have one, you can download them from the internet. If you use a map from around the Donner Lake area (California and Nevada) , they will be able to see the elevation changes that the Central Pacific had to deal with. Also, tracks could not be laid out with sharp turns, or they would have too many accidents. You can also look for other features that would cause problems, such as rivers, lakes, mountains and gullies. We can look in books to see pictures of trains from the past, and look on the tracks to see trains of today. But what will trains look like in the future? · Provide a large assortment of crafting materials (such as cardboard tubes, cardboard, craft foam, construction paper, pipe cleaners, juice cans, empty containers in different sizes and shapes, etc.) and glue and scissors. · Let the boys use their imaginations to create a train of the future. · Give it a name and describe some of its special features. Use this box to keep wrapped candy or small toys. 1. Cut off the lid and top flaps at the folding line. 2. Draw four circles about 1 1/4” diameter out of scrap cardboard. 3. Make a small hole in the center of each wheel. 4. Cut the 2 pieces of straw about 1 1/2” long. 5. Tape the straw pieces to the bottom of the box. 6. Put a toothpick through the straw. Attach wheels. Take a train ride without leaving the comfort of your den meeting. Make a scene that you could see from a train window. It can be as silly or serious as you would like. Use your imagination and creativity to see what kind of train ride you can design. Utility knife; Masking tape; Pencil; ruler. 1. Using a pencil, start sketching a view outside the train window directly onto the poster board. 2. Color it with colored pencils, markers, or crayons. 3. Measure a 20” x 28” rectangle on the corrugated cardboard. 5. Center the poster board scene exactly in the middle of the cardboard rectangle. 6. Trace the outline of the poster board onto the cardboard. Remove the poster board. 7. Draw a second outline 1/4” inside the outline on the corrugated cardboard. To do this easily, make a dot 1/4” inside each corner, then connect the dots with a ruler. 9. Decorate the front of the frame if desired. 11. When it is positioned right, flip both boards over and tape your drawing securely to the back of the frame. 12. Display at the pack meeting. · If you have enough stuff, each boy can make his own train or get a large piece of cardboard and have each boy make a ‘car’ for the train. · Lay out the “track” with tongue depressors/craft sticks and straws. 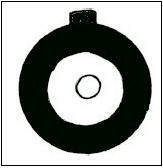 · The Oatmeal round boxes make wonderful “engines”. · Use the used thread spools as the smoke stacks, with a small box for the engineer’s cab with the wheels made of juice can lids or paper plates. · Have the boys use construction paper to cover the boxes and make the front apron. · Then use the yarn or twine for the bars on the wheels. Gluing some polyester stuffing or stretched cotton balls on top of the thread spool gives the look like a working steam engine. Use the blocks made for pinewood derby cars to make railroad cars instead. Assign each boy or family to make a certain kind of car, using the block as the basis. In a large pack, with several dens, each den or den families could form one train. In a smaller pack, you might have just one train, with each boy or family making a car. Be sure and furnish them with information about where they can find a picture of their type of car. See the website list for ideas. There should only be one caboose (a car that really isn’t used anymore, except on historical railroads) and possibly only one engine, although some freight trains are pulled by more than one engine. 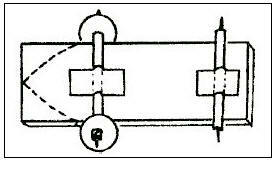 Make sure that each car has one end left free, so that a hook can be added to form a train. At the pack meeting, den trains can race against each other, or families can race one another or partner with another family to form a longer train. Have someone ready to do a weigh-in and add weight if needed. You may want to change the rules as far as weight, since most cars will use the whole block of wood. Once there has been a race, let everyone mix it up and race various trains.